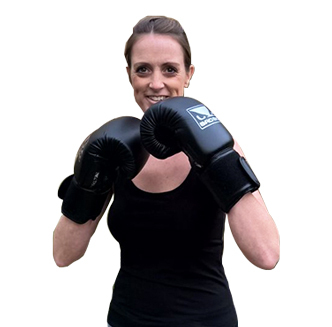 If you’ve just landed at this page, you might like to read my introduction and my Boxing Training Début on Day 1 of this Fight Yourself Fit journey. Embarrassing photo alert! I’ve been dreading taking these photos all week (although the thoughts of it has spurred me on during the workouts!). 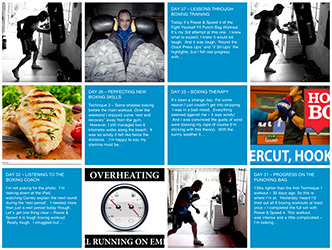 So, here they are – my photos from the end of Week 4 – you have been warned! How do I feel about it? I’m under no illusions here. 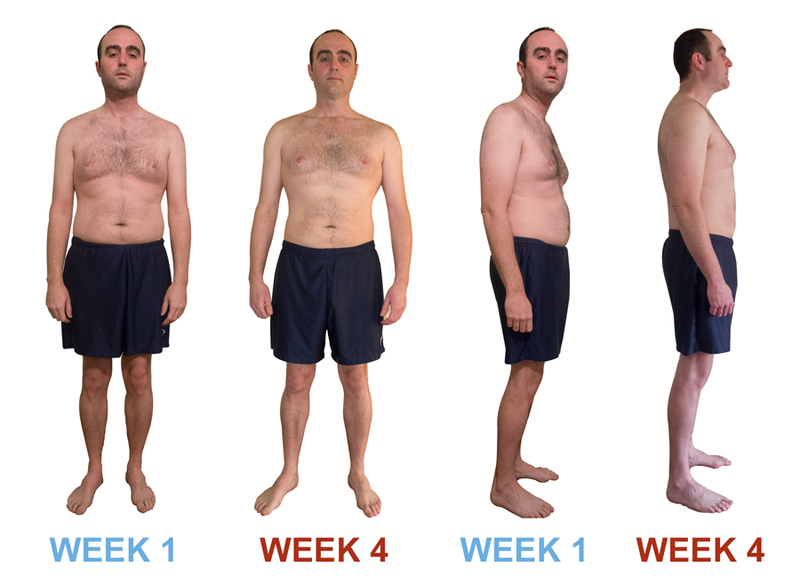 There’s years worth of inactivity and bad food choices sitting in my body – and it’s not going to be reversed in a few days. 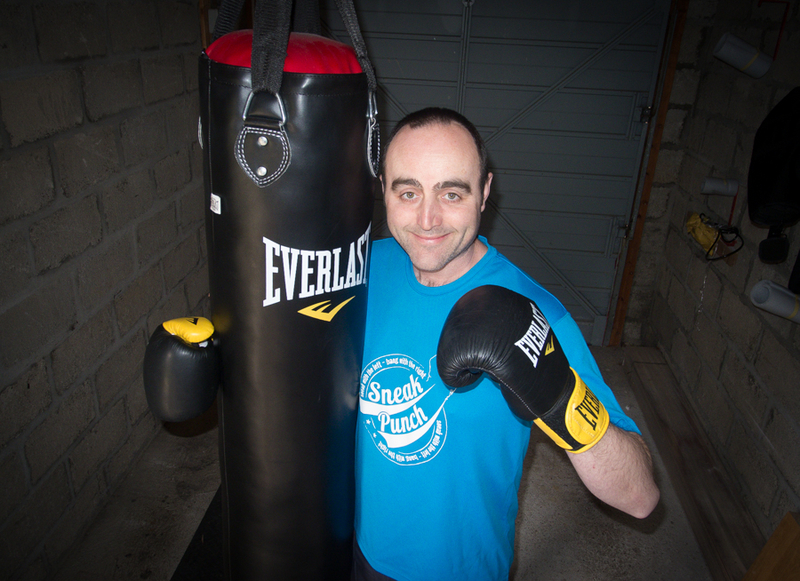 But after only 4 weeks of boxing training , starting from zero with no boxing experience – I’m really pleased. Sure, there’s a long way to go – but I’m relieved everything is heading in the right direction! Weight – I knew I was losing weight and I’m very happy to have lost 12lbs. It’s hard to imagine 4 weeks ago I was carrying around an extra 5 kilos. I feel there’s also been significant muscle gain (particularly with my shoulders – they feel a lot bigger and stronger). Chest – Although they’ve been with me for a long time – the ‘moobs’ are slowly showing some sign of retreat. A 2.5″ reduction is more than I hoped for. I wouldn’t go as far as saying the moobs are ‘perky’ but there’s definitely some ‘uplift’ to be seen. Certainly a lot less wobble during skipping! Belly – Probably my toughest challenge. I’m convinced sitting all day doesn’t help the cause. 2 inches around the belly means I’m better off by 1 notch, nearly 2 notches on the belt . This could mean 3 pairs of barely worn trousers in my wardrobe will be seeing the light of day again. 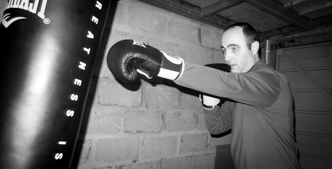 I knew boxing was an intense workout but I now appreciate it’s also highly skill-based. There are many techniques and combinations to learn. 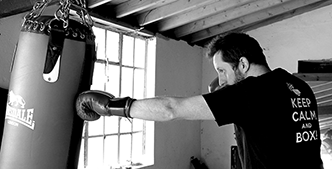 With boxing it’s almost impossible to get bored, because there is always something new to learn or something to improve on (hitting faster and harder or focusing on perfecting the technique). There’s simply no time to get distracted or just go through the motions. It’s kept me on my toes that’s for sure! #Day 26 – Taken this morning at the start of ‘Technique 4’ (Close Up). I’m looking at bit happier than my Day 1 photo! Probably the most important lesson I’ve learnt is ‘You can always do more than you think’. 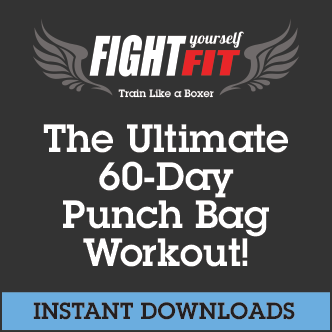 There have been days of tiredness and many moments during the workout when I could barely raise my arms to hit the punch bag. But having reached the 1 minute rest period in between rounds – there’s time to recover and start off again with a different exercise. You just need to keep saying “the aching is temporary”. Overall, I’m pleased to have done something that I previously thought was beyond me. Boxing training has been the toughest thing I’ve ever done. I’m confident the progress in weight loss and muscle gain will continue – if I show up and put the work in for the next 4 weeks of boxing training. 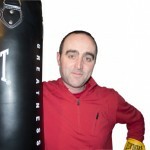 But I’m also equally looking forward to learning more about boxing – and that’s probably the biggest surprise of all. Until next week! Cheers, John. 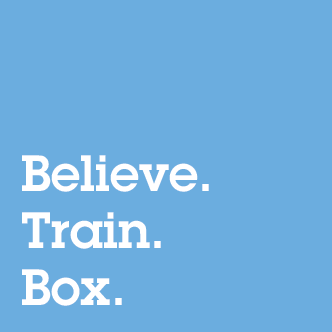 We’d love to hear the success after 4 Weeks of Boxing training. Feel free to add any comments below.